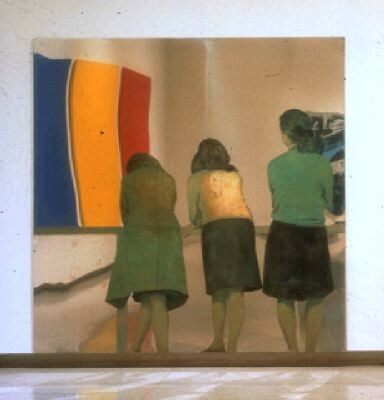 Michelangelo Pistoletto, Tre ragazze alla balconata (Three girls on a balcony), 1962–64, oil and graphite on tissue paper mounted on mirror-polished stainless steel, 78 3/4 x 78 3/4 x 7/8". “Zero to Infinity: Arte Povera 1962–1972,” an overdue museum survey devoted to the Italian art phenomenon of the 1960s, attains its full contemporary significance via its transcontinental bounce from Minneapolis to London. Conceived by Richard Flood at the Walker Art Center, the exhibition was cocurated by Francis Morris of Tate Modern, where it first appeared. The great brick pile of the Bankside power station makes an entirely appropriate setting for the show’s debut, as it underscores the degree to which we have come to live in an arte povera world.